▷ Typically the bolder the pattern (colors, contrast, and scale) the less formal the tie will appear. Traditional paisleys in classic colors (reds, navy, hunter green) are perfect for a sophisticated wardrobe such as brass button blazers and/or Harris tweed sports coats. For more matching inspiration please also check out our Secdtie on Paisley Ties. Pre-tied Bow size set(length x width): 4.5 x 2.4 inches(12 x 6 cm); For neck size(Adjustable): 13-19 inches(32-43 cm); Handkerchief/pocket towel size: 10 x 10 inches(25 x 25 cm); Crafts: Jacquard woven paisley/checks/plaids/polka dots bow tie set; Material 100% care-free microfiber, Package include: Bow tie & Pocket Square & Cufflinks Set. Top off your lavender wedding pallet with a bow tie that soothes and delights. Add a calming tone to your groomsmen ensembles with a lavender colored bow tie that's as graceful as it is winsome. 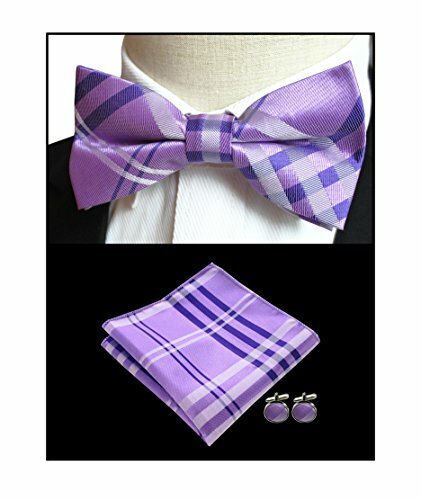 Designed by Secdtie, this piece is woven with a pattern of checks and is pre-tied for perfect bow tie dimples. An adjustable neck strap makes for easy wearing and will fit neck widths between 12"-19.5". Lavender is a wonderful color for the spring, and with a delicate pattern of white and purple stripe cross forming lattice this piece is just the ticket for adding charm to the classic black suit. This tie is just the ticket for groomsmen's ensembles. Put together a magical outfit by pairing it with a white collared shirt, a classic black tuxedo, and a matching pocket square. If bow ties aren't your thing, this style is also available in a regular length necktie.